Briar Group introduces our newest product line, English Estate Turf. 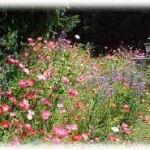 Enjoy the beauty and the ease of maintenance of grasses, clover and flowers that grow in the English country side. All species are low growing and create a soft, cushy mat of green grasses, strawberry clover, English Daisy, Johnny Jump Up Pansy, Purple Rockcress and Baby Blue Eyes with White Sweet Allyssum. Forget about the weekly mowing and edging of your formal turf lawn and enjoy the feeling of an English Country Estate. It needs less frequent watering too. If country living is your style, we highly recommend our new English Estate Turf. Forget about the weekly mowing and edging and enjoy the feeling of an English country estate. Equine Pasture Mix is for members of the horse family. Our pasture mixes are certified to be endophyte-free. 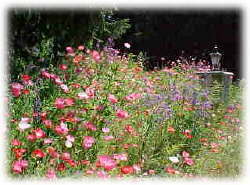 Deluxe Wildflowers with low growing grasses. The visual appearance reminds you of an alpine meadow. slopes are 2:1 or less. 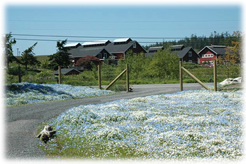 control in meadows and roadsides. blooming season that runs from May to October. will pay off in your scores on the course.